Kid President was such a good pep talk for us as teachers today and the bit I liked the best was when he said teachers should be teaching and students should be studenting. We started our meeting with the pep talk and it lightened us all up and we were ready to work and share ideas. That ought to teach us something about how to engage learners in a positive way. It is about being positive and cutting through the blocks and barriers to learning. It is about attitude. From that point onwards we shared ideas, showed each other other videos and our ideas for the personal and social capability and it meant we could see our way through to having more positive action with regard to this capability. Categories: general capabilities, Happiness, Leadership, personal and social capability, self-management, social management, Thinking, Year 10, Year 8 | Tags: ACARA, Kid President, personal and social capability, positive thinking, self awareness and self management | Permalink. It doesn’t matter whether you look at it from the original, social awareness, perspective and appreciate the diversity of others and say You matter or whether you look at it from the self-awareness perspective and think I matter, the truth is … we matter. Personal and social awareness relate to our feelings of self worth and the worth of others in our lives. Self respect and mutual respect. From a teacher point of view it is about being a champion for those you teach. Categories: ACARA, general capabilities, Happiness, personal and social capability, self-awareness, social awareness, Wellbeing, What about me? | Tags: ACARA, personal and social capability, positive psychology, positive thinking, self awareness and self management, self-awareness, self-management, you matter manifesto | Permalink. Now I have been through the self review of the personal capabilities of self-management and self-awareness I can already see the time was well spent. Yes, already. From the time we looked at self-awareness there was a culture change in the class to that of being more focussed and particular. Having also done the self-management and then the goal setting I can see the benefits already. I now have ways of expressing how to improve. It’s consistent because we have all done that exercise. I can now ask all students to be on the same page with regard to blocking and enabling, with regard to how they can make the most of their learning time, with regard to how the are helping or not helping each other and themselves. What they liked was having some clear messages as a whole class about how they can help themselves and what appropriate behaviour is. I need to keep pursuing this. It’s a strength of what we have just achieved. I am wondering if they will deal with their sleep issues and their health and fitness. What they really liked was being able to give themselves a mark out of 10. In fact, they told me that is how they should assess themselves! They also like being able to say if they needed help or not and who would help them. The time frame was something that annoyed them. they didn’t want to have to say when so frequently they responded “as soon as possible.” I maybe need to look at that part of the self review to come up with something better. I now have to decide when to do the social capabilities. Probably next term. Ideally it should be personal capabilities in the first semester and social capabilities in the second semester. Next year I can start with this. If you click on the link, you can download a copy of the self review I made and use it for your own purposes. Categories: ACARA, Behaviour Management, general capabilities, personal and social capability, Review, self-awareness, self-management, Year 8 | Tags: Australian national curriculum, goal setting, personal and social capability, personal capabilities, self awareness and self management, self review, self-awareness, self-management, Year 8 | Permalink. After I had worked on the self-awareness and self-management capabilities with my students they had worked out for themselves that getting enough sleep would help them perform better in both of those elements. It was a frequent response in their self-reviews that they needed to get more sleep. It certainly ties in with the research that is available. Source:How much sleep does a teenager need? The happy child site is worth visiting since it gives a great deal of practical and sensible information about teenagers and their need for sleep and the reasons why it might be difficult for them to sleep and how to address those. The other site , more directed at students themselves,which is well worth a visit for the useful and down to earth information is kidshealth. Categories: ACARA, Behaviour Management, general capabilities, Happiness, personal and social capability, self-awareness, self-management, Stress, Wellbeing, Year 8 | Tags: ACARA, Australian national curriculum, management capabilities, personal and social capability, poor performance, self awareness and self management, sleep, sleep problems teenagers, teenage sleep, underperforming students | Permalink. 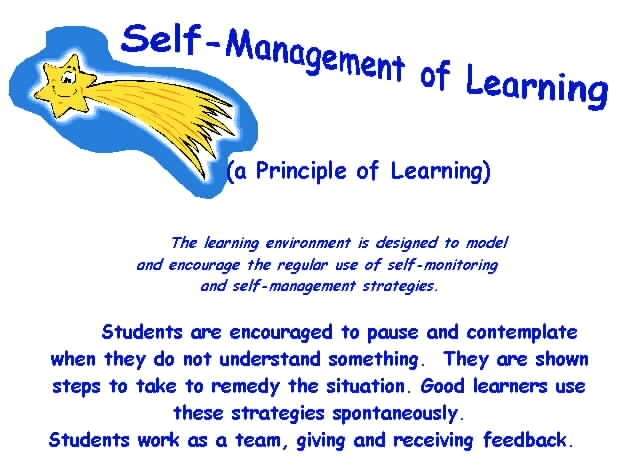 from self-awareness belongs with these ones in self-management. Now I have to work out how I will apply these to individuals and a whole class in terms of lesson routines and protocols. Self-management is more about limitations and how some people limit themselves and so never achieve their potential. Self-awareness is more about taking yourself from strength to strength and means you are already on a positive course. maybe not. maybe it can apply to any state of being. Something to explore. Categories: ACARA, Behaviour, Behaviour Management, general capabilities, personal and social capability, self-awareness, self-management, Year 8 | Tags: ACARA, Australian national curriculum, personal and social capability, self awareness and self management, self-awareness, self-management | Permalink.